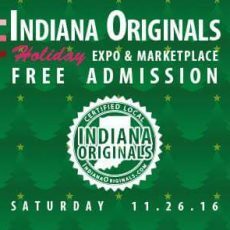 The Indiana Originals Holiday Expo & Marketplace is excited to showcase some of Indiana’s best products, services, and goods and show that supporting local is easy if you know where to look! This event promotes professional services, art & gifts, restaurants, shops, and more! All participating businesses are locally owned and operated and headquartered in Indiana. Spend your money locally this holiday season!